Babyscripts, the leading prenatal app and the first mobile clinical tool to allow OB/GYNs to remotely monitor their pregnant patients’ progress and health, will launch a Postpartum Module with innovative health systems on or around June 1, that allows providers to integrate the new American College of Obstetricians and Gynecologists (ACOG) guidelines on postpartum care in both an innovative and scalable, tech-enabled manner. ACOG announced last week a new committee opinion emphasizing the need for a transformation in the delivery of postpartum care and directly identified telemedicine and apps as practical tools to increase compliance to the new postpartum protocol. While this paradigm shift will benefit patients and their care, there is a corresponding concern about how providers can practically incorporate these recommendations in their day to day workflow without interruptions and in a cost effective manner. An example of how Babyscripts can help a practice adopt this guidance is to take the new recommendation of a postpartum follow up consultation within the first 3 weeks after the birth and enable that consultation to be delivered through a digital, asynchronous visit on the Babyscripts app. This kind of transformation could allow the practice to comply with the new guidelines, while simultaneously better managing the flow of patients into the office given the current constraints in reimbursement for postpartum care. Babyscripts is a virtual care platform for obstetrics that allows OBGYNs to deliver a new model of perinatal care. The platform is powered by a suite of mobile apps that drive better patient decision making, internet-connected devices for remote monitoring, and a host of population health tools to give providers access to patient data in real time. When using these tools, patients experience increased engagement and satisfaction, while OBGYNs are able to identify patient risk more quickly, improve clinic workflow, and make more money. After launching in 2014, the company moved from managing only low-risk, private-pay patients to managing higher-risk patients, including women with hypertension and gestational diabetes, and patients on Medicaid. The app offers a whole end-to-end risk-stratiﬁed model that allows a provider to have a virtual experience with about 90% of his or her pregnant patient population. BabyScripts works with more than 15 health systems across the United States that manage more than 80,000 births in 13 different states. 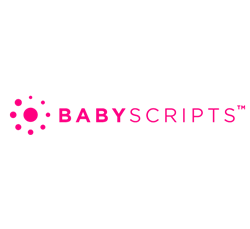 Babyscripts™ is a new model for prenatal care that is transforming the way expectant mothers use technology to work with their OBGYN practice. It’s the first mobile, clinical solution to provide remote monitoring of an obstetrician’s patient population while directly improving patient satisfaction and practice reimbursement.